This post can also be read on Cyclismas. The first week of le Tour has given us some of the most exciting racing I've seen in ages, as well as the worst blows to several GC contenders and other riders. The number of accidents so far is high, but so are the numbers every first week of the Tour. The Tour is the biggest and most important race of the whole season, and everybody is nervous. There are many teams and many riders too, making it difficult closing in on narrow roads. Marco Pinotti, the Italian HTC-rider, tweeted about this last night, saying that there are too many riders present in the Tour. What makes this Tour special is the of course the fact that many GC contenders are out of the race or far behind already, with Wiggin's crash yesterday fresh in mind. Photo by AP/Christophe Ena, downloaded here. 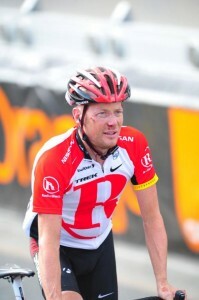 Also hard to watch was Radioshack's Chris Horner, obviously suffering from a concussion after a fall, being very disoriented coming across the finish line in Châteauroux. Horner fell in the same crash as Wiggins, which means he rode 38km in that state. The RS member who greated Horner when he crossed the finish line, said to Horner he crashed 25km from the finish, but other reports says otherwise. Of course, riders safety is the number one priority and riders in the state Horner was in yesterday is a danger both to himself and other riders. Many have argued on twitter that the UCI is more concerned with seat tilt angles than rider safety. Determining whether a rider has a concussion can be hard from a distance through a radio. Perhaps is it necessary to apply a rule that says that if riders hit the deck, a DS and a race doc should physically check up on the rider, making sure he is ok. What some believe is strange is that Horner receive treatment by the race doc after the crash, reports say the doctor wrote that Horner had a concussion and still left him on the bike. In addition to this, Johan Bruyneel had his team doctor driving next to Horner the last 38km. Bruyneel sais he won’t be criticized over his decision to let Horner finish the stage. Photo by Sirotti, downloaded here. After all, the number of UCI commissaires is not that high to be everywhere, but this is a matter that should be number one priority. Geraint Thomas, one of Team Sky's young stars, wrote yesterday that riders safety must be the riders' responsibility. My position in this matter is that that the rider safety is divided between the rider and the team leader. When the rider is not able to take that call, then it is the rider’s leader who needs to step forward and take the responsibility. A rider and a team riding for GC that really have impressed me the first week is Cadel Evans and BMC. The team is always to be seen near the front when the terrain is difficult, or in the last important part of the race. Very tactically ridden and a nice way to keep him out of potentially dangerous episodes. Now, one could argue that this is one of the reasons crashes happens in the first place, the constant hunt for positions. Next stage, be sure to watch out for Cadel Evans and BMC, I guarantee you, they are at the front at the right time.